This one’s for all my planner fans out there, you know who you are! Back in September I shared my Fabric Fauxdori Cover video and promised that I would go more into what’s inside it at a future date. Of course, then October and the Halloween madness struck, and now it’s November and I haven’t fulfilled that promise yet! Allow me to fix that. The decision to decorate your planner is apparently fraught with peril. As much as I love stickers, I have a lot to keep track of, so I dress my planner up in small ways like with the washi on the page edges. Another benefit of that washi? It reinforces the edges of the paper, making the planner a bit sturdier (at least in my experience). 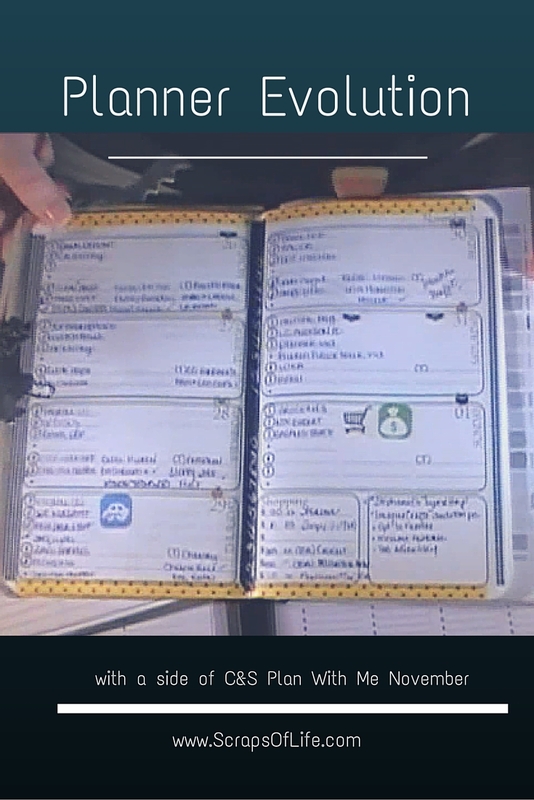 And I’m still absolutely loving my faux-dori planner cover and how easy it is to work with and add things to–I don’t miss ring binders at all! For anyone still on the hunt for their 2016 planner, the Creative Days Monthly/Weekly Planner is available now in my Etsy shop. with fixed appointments only an occasional thing in my life. So all the planners out there that are 50% or more time slots? Not for me. I noticed, back on my hunt for a 2012 planner that started me down the DIY road, that the planners with menu sections were either geared towards moms or had an overly simplified week on a page layout (or other froufrou decorations that didn’t suit me). Of course, had the planner community been then what it is now (or had I known of it), maybe those not-quite-right planners could have benefited from some serious sticker action! Whatever format you choose to use, I really think everyone can benefit from some sort of time management system. Whether it’s a bullet journal, ongoing to-do lists, even chore charts–whatever takes the guesswork out of the day is going to help you get more done. And it’s not just about making more money and being more productive at work or in your business, it’s about making time for the fun stuff, too. If you check off those boxes for the things you need to do, then you can do the things you want to do with less (or better yet, absolutely no) guilt! Do you plan? If so, what sort of system do you use? If not, why not? I use a basic planner for blogging, and a regular ol’ calendar for appointments and things like that. I like the idea of creating my own planner for blogging though. They can be really expensive to find just the right kind! Can someone just buy me a planner already I am in desperate need of one haha. Love the video.. There are a LOT of free planner pages on the web just a Google search away, and plenty more on etsy at all price points. Finding planner peace has been a struggle. I continue to have to tweak as my life changes! That makes perfect sense, Cynthia–our needs are going to change as time goes on. Goodness, so organized! Ive been creating pages more for fun than anything, lol. I absolutely love planners! I use a personal filofax right now,but with my blog growing I’m thinking of upgrading to an A5 size! I tried out personal size, but between my natural handwriting and the sheer mass of stuff I need to keep track of, A5 is the smallest I can go for a regular planner. I have the planner from in the leafy treetops and I couldn’t live without it! It is my lifeline! I hadn’t heard of In the Leafy Treetops–their planners do look very thorough, I can see why you like them! I keep attempting to keep a planner and so far, I’ve found that it’s just not my thing. I’m sure I’ll continue to try though! What types of planners have you tried? I think format makes a big difference. If traditional planners don’t do it for you, maybe a bullet journal or a book of lists would be more effective? I LOVE planners. My husband thinks I’m crazy for still using paper but I will not give it up. I will never go fully electronic. You are so organized. I just use an ordinary planner for blogging. I am useless without it. I do rely on my planners. I feel like Im very on top of things. I have my mommy planner and my blogger planner. I wish I was this organized. I’m more of a fly by the seat of my pants kinda gal! Is there a way I could help you get organized? A routine we could start for you, perhaps, to organize one part of your schedule and then expand to others? I wish I could be this organized! I’m working on it! Yay for working on it! What areas are you having trouble with? I haven’t gotten into the planner community yet. I do most of my planning on my computer, but keep a notes or to do list next to it. I have been thinking about picking up a planner this year, but I’m not sure yet. There are a lot of options out there, it can be a little overwhelming. If you’re already using your computer to plan, then you already know what sorts of things you find important enough to track. Keep those in mind when you’re evaluating different systems and don’t let something like a trendy company or big community sway you to something that just isn’t going to work for you. What a wonderful planner! I am loving being organized more now with my planner. Thank you! Which planner do you use? I need to work on my organization! I have a planner but it just doesn’t suit what I need anymore. The awesome thing about today’s market is there’s pretty much a planner for anything. Good luck finding something that better suits your needs, and if you can’t, let me know–I might be able to help! It’s funny – for my full time work life, I’m super organized. When it comes to blogging, which is not currently my full time job, I’m nowhere near as organized. I need to organize more so I can continue to grow my blog! I use a combo of my paper planner and a Google Sheets document for my blog planning. The spreadsheet allows me to plan around future events, then I transfer the current week’s titles to my paper planner to make sure they get written. Definitely helps with staying consistent! I’m all for putting repetitive things on auto-pilot as much as possible: on going to do lists, chore charts.. it makes me so much more productive. Your planners are very cute. I will check out your etsy store. Was InDesign hard to master in the beginning? Thanks, Eva. I’d been working with one form of Photoshop or another for several years, so when I started to use InDesign it really just took me a few tutorials here and there to get the hang of it. Being familiar with the Adobe basics made it a lot easier; I didn’t have to learn new symbols or figure out how they thought. I also taught myself Illustrator crash course-style when a long-time client needed a job that was better suited for vector art over raster, so I suppose it depends a lot on learning style, too. It’s November 4th, Do You Know Where Your Christmas Cards Are?